Panetta, speaking on CBS’s “Face the Nation,” also reiterated the tough U.S. stance toward Iran’s threat to close the Strait of Hormuz, which is vital for oil shipping in the Gulf, saying the United States would not “tolerate” it. “That’s another red line for us and … we will respond to them,” he said. “They need to know that … if they take that step, they are going to get stopped,” Panetta added. The United States is concerned that Iran’s nuclear program is aimed at producing a weapon, but Tehran insists it is for peaceful energy production. The tough talk comes days after President Barack Obama unveiled a new military strategy that calls for a smaller force as the United States cuts $487 billion in projected defense spending over the next decade in an effort to deal with the nation’s $14 trillion debt. The new strategy, which is meant to identify spending priorities as the military cuts back, calls for greater emphasis on Asia even as the Army and Marines shrink to become smaller and more agile forces. Dempsey said he worried that some countries might misunderstand the debate Americans are having over changing strategy and the need to cut defense spending. He said such a miscalculation could be “troublesome” in dealing with countries like Iran or North Korea. Panetta said U.S. rivals should not misunderstand the situation. “I think the message that the world needs to understand is: America is the strongest military power and we intend to remain the strongest military power and nobody ought to mess with that,” he said. Obama and Congress agreed in August to cut some $487 billion in defense spending over the next decade. As part of the August deal, defense spending could be cut by another $600 billion unless Congress compromises on an alternative. Congress missed a deadline for reaching a compromise that could have stopped the new defense cuts, but it could still take action to override the spending reductions before they are due to go into force next year. Obama, in unveiling the new defense strategy at a Pentagon news conference on Thursday, noted that even with the $487 trillion in cuts to projected spending, the defense budget would continue to grow in nominal terms. He also said the U.S. defense budget would still be by far the world’s largest – roughly the size of the 10 next-biggest defense budgets combined. If the second round of defense cuts takes place, the Pentagon’s base budget would fall to roughly $472 billion in fiscal 2013 – about the level of fiscal 2007 in inflation-adjusted dollars, according to an analysis by Todd Harrison of the Center for Strategic and Budgetary Assessments. That represents a real cut of about 11 percent. It would remain at roughly the same level for about eight years, growing only at about the pace of inflation, Harrison’s analysis said. 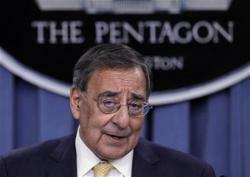 Panetta told National Public Radio on Sunday the Pentagon was not ready for cuts of that magnitude. “If we had to do over a trillion dollars in cuts in this department, I have to tell you that the strategy that we developed, we’d probably have to throw that out the window and start over,” he said. Esse post foi publicado em Assuntos Internacionais, Defesa e marcado defesa EUA, estrategia nacional defesa EUA, Penetta por Joanisval. Guardar link permanente.